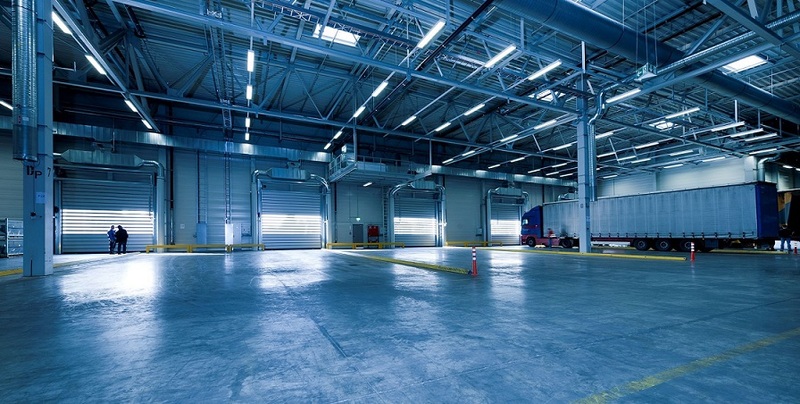 Sector occupancy ticked up QoQ, driven by take-up of newly completed warehouse space. However, sector occupancy was lower YoY. JTC recently released its Quarterly Market Report of Industrial Properties for 4Q 2017. Unchanged from previous quarter, managers generally gave feedback that they are seeing more enquires compared to a year ago. However, it is still taking time for enquiries to convert into actual transactions. Managers are still actively engaging tenants to maintain occupancy, as it is a tenant’s market. Demand is coming from trade sectors such as transport and storage, IT, precision engineering and food and beverages. We also hear managers emphasising on tenant credit quality. Mapletree Industrial Trust (MINT) expanded its investment mandate to include data centres outside of Singapore, capped at 20% of aggregate portfolio value. And Soilbuild Business Space REIT (SBREIT) expanded its mandate to include Australia. ESR-REIT would acquire all the stapled securities of Viva Industrial Trust (VIT) by issuing new ESR-REIT units. In a prior sector report (May 11, 2017), we had listed Viva Industrial Trust (VIT) as one of the possible targets for Cambridge Industrial Trust (now known as ESR-REIT), on the basis of Mr Tong Jinquan’s majority interest in VIT. Consolidation of smaller REITs improves scale and could bring about better operating efficiencies. Industrial S-REITs generally reported negative renewal rates in 4Q 2017, with the exception of Ascendas REIT (A-REIT, +5.8% renewal for Singapore portfolio) and Mapletree Logistics Trust (MLT, +4.5% renewal for Singapore portfolio). Our view remains unchanged for negative reversions to persist in 2018, and we believe rents to bottom only by the end of 2018. 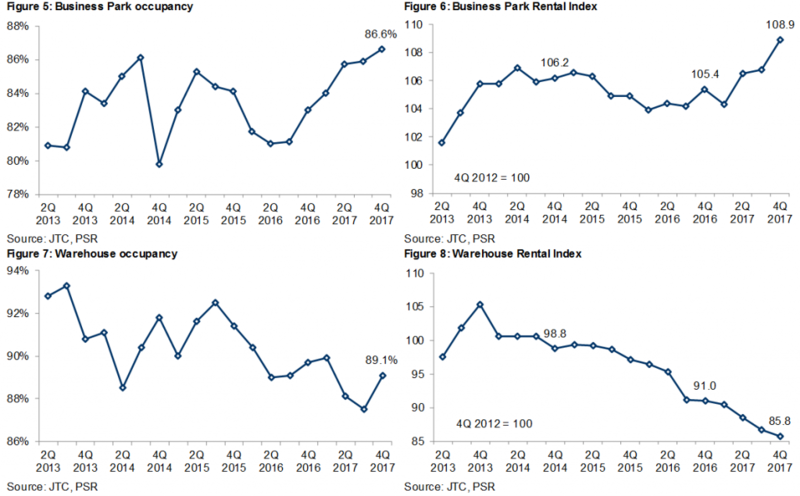 Industrial REIT managers are expressing varying degrees of optimism – some believe rents to bottom in 1H 2018, while others believe it to bottom in 2H 2018. 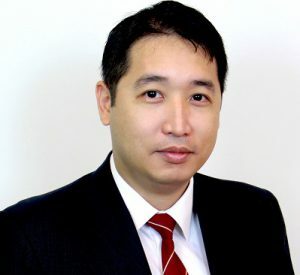 The soft rental market resulted in investment property revaluation losses for the six REITs (Cache Logistics Trust, ESR-REIT, Keppel DC REIT, Sabana REIT, SBREIT and VIT) that reported their full year results. We maintain our “Equal Weight” view on the Industrial sub-sector. The tailwinds for the sector are the tapering of supply of Industrial space in 2018. 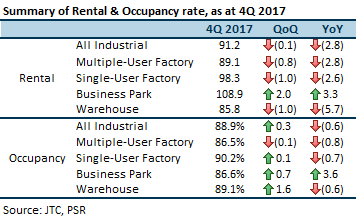 In line with the robust industrial activity, 4Q 2017 Rental Index occupancy was higher QoQ, albeit driven by Warehouse segment only, and Business Park segment to a lesser extent. The uncertainty is the exact bottom for rents, but we believe it to be by end-2018. Negative reversions also likely to persist in 2018, in view of the higher Rental Index from three years ago. 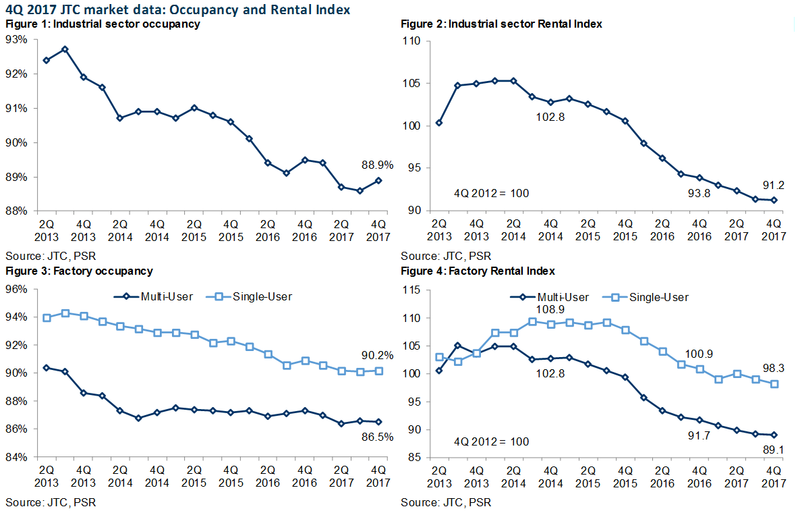 We would like to see a broad-based improvement in occupancy, in order to upgrade our sector view for Industrial REITs. Singapore is evolving towards higher value-added manufacturing and there is a push with the Smart Nation initiative. We like REITs that can capture this opportunity with Business & Science Park properties and Hi-Tech/Hi-Specification buildings. At the same time, Business & Science Park rents are expected to be stable, underpinned by limited new supply. We upgraded Cache Logistics Trust to Accumulate during this results cycle, on the basis of its strengthened balance sheet and ability to execute its rebalancing strategy. We also ceased coverage on Soilbuild Business Space REIT due to reallocation of internal resources. Key downside risk of CWT Commodity Hub (26% by portfolio value as at FY17) master lease expiry, has been partially mitigated with pre-commitment from underlying tenants for two-thirds of NLA.